At the upcoming Rob|Arch 2012 conference, eight universities are organizing robot workshops and 18 papers will be presented, alongside cutting edge developments of industry partners. As a 5-day event cannot cover the whole scope of robotic fabrication in architecture, art, and design, the Association for Robots in Architecture invites research institutions and companies, as well as individual artists, architects, designers, engineers, researchers, and students to submit video presentations of their robotic work to the Rob|Arch 2012 conference. The video clips should showcase new developments and innovative projects relevant to the conference topic of robotic fabrication in architecture, art, and design. 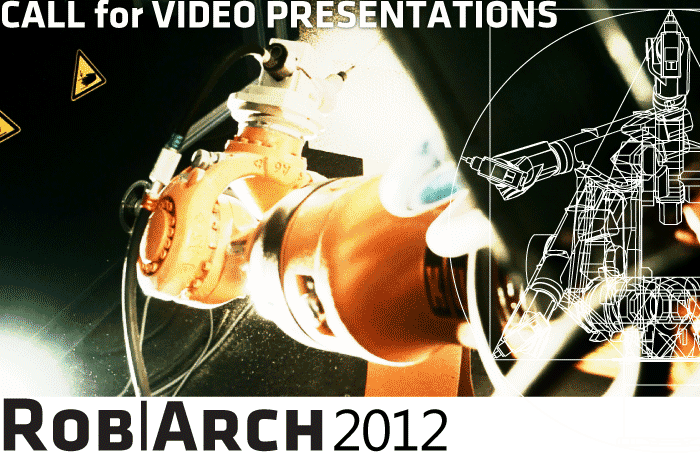 All video presentations approved by a jury of experts will be shown at the conference/exhibition to the Rob|Arch 2012 attendees, among them CEOs of major robot companies as well as industry partners and internationally recognized researchers, architects, and artists. They will also be published on the Rob|Arch conference home page, www.robarch2012.org, to a wide internet audience.